This is a flavorful tilapia recipe sure to please your guests. Remember to grill the tilapia on one side so that the Thai seasoning mixture won't get lost in the flame. Serve these delicious fillets over rice with grilled vegetables for the perfect meal. 1. Place garlic, 1/3 cup cilantro, oil, lime juice, coconut milk, fish sauce, white pepper, sugar, ground coriander, kosher salt, and curry powder in a blender or food processor. Pulse ingredients 10 times, until well combined. 2. Place fillets in a shallow glass dish and coat tops with marinade mixture. Cover with plastic wrap and let marinate in refrigerator for 30-45 minutes. 3. Preheat grill for high heat. Right before placing tilapia onto grill, oil grill grates using outdoor cooking tongs, folded paper towel and oil. Grasp paper towel with tongs, dip into oil and rub across grates. Do this 4-5 times to create a non stick surface. This is really important when grilling fish as it prevents it from flaking and falling apart. 4. 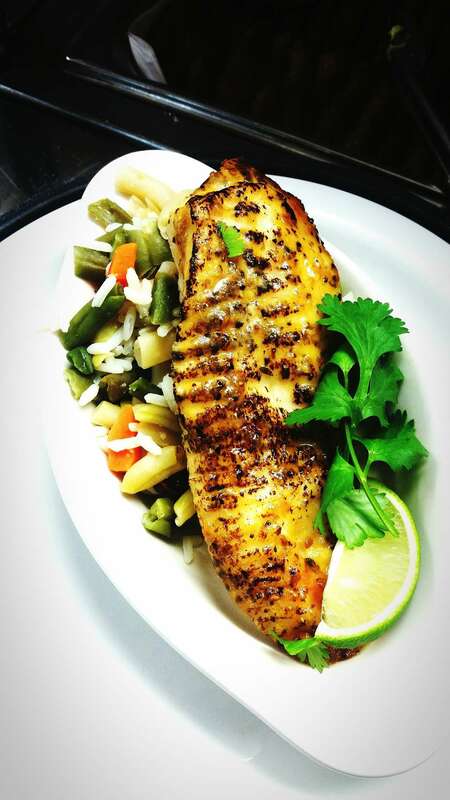 Place tilapia fillets on an oiled grill rack and cook for 15-20 minutes, or until fish reaches an internal temperature of 145 degrees F. Remember not to turn fillets. Once cooked, carefully remove from heat, garnish with cilantro leaves and serve with lime wedges.